Rev. 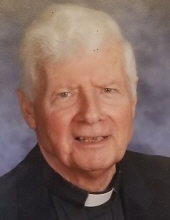 Mr. William E. Dirk age 85, retired Deacon for the Diocese of Cleveland after 35 years of service. Bill is the beloved husband of Judy (nee Stine); dear father of Bill (Pam), Julie (Jay) Strukel, Marcus (Sarah), David (Angela), Andrew (Allison); grandfather of Alexandria, Mary, Deacon, William; brother of Marjorie Langdon and the late Rosemary and Robert; uncle and great uncle of many. Bill died April 3, 2019. Vespers of the Dead will be sung on Sunday April 7 at 3 PM at Our Lady of Peace Church, 12601 Shaker Blvd., Cleveland, Ohio 44120 where family will receive friends until 8 PM. "Email Address" would like to share the life celebration of WILLIAM E. DIRK. Click on the "link" to go to share a favorite memory or leave a condolence message for the family.